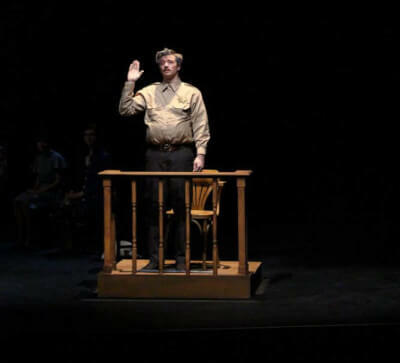 The theater department’s fall play, “The Many Deaths of Danny Rosales,” showcased themes of racism, police brutality and the United States justice system. The play, directed by Jorge Huerta, debuted Nov. 8 and ran through Nov. 11. Huerta’s close friend and playwright, Carlos Morton, based the story on a real-life court case in the late 1970s in central Texas. In the court case, a police chief was on trial for the murder of a young Chicano man, whose story is retold through the narrative of Danny Rosales, the main character featured in Morton’s play. Huerta, a part-time visiting professor at Occidental this semester, said he wanted to select a play that would fit the school and feature demographics representative of the student body. He said he appreciated that Morton had written key characters who were female and people of color. Jessica Lilibeth Rodriguez (sophomore) portrayed the character of Berta, the grieving wife of Danny Rosales. Morton designed the play in a docudrama style, incorporating information from newspaper articles and court transcripts, although he added fictitious elements to the story and changed the names of some characters. 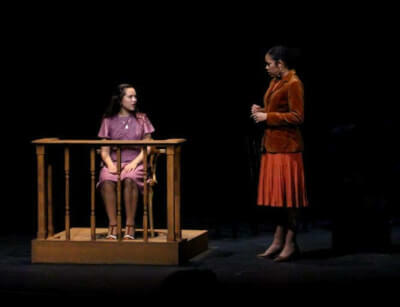 The play is set in a courtroom; different characters take to the witness stand and provide varied flashbacks as the story of Rosales’s death unfolds. Morton said he wanted to include the different perspectives of each character in order to create more ambiguity and let the audience think. The story depicts the defendant and main antagonist, Fred Hall, played by Seaton Crossman (junior), as a police chief with a personal dislike for Rosales. Suspecting Rosales is responsible for burglaries in town, he eventually arrests Rosales at his house and takes him out to the woods, where a shot resounds offstage. In court, Hall’s lawyer, played by Yoshi Wainwright (sophomore), focuses on Hall’s supposedly impaired mental state, while Hall maintains it was an accident. In a Q&A following the Nov. 10 show, audience members and associate theater professor Laural Meade posed questions about the story’s place in 2018 America. 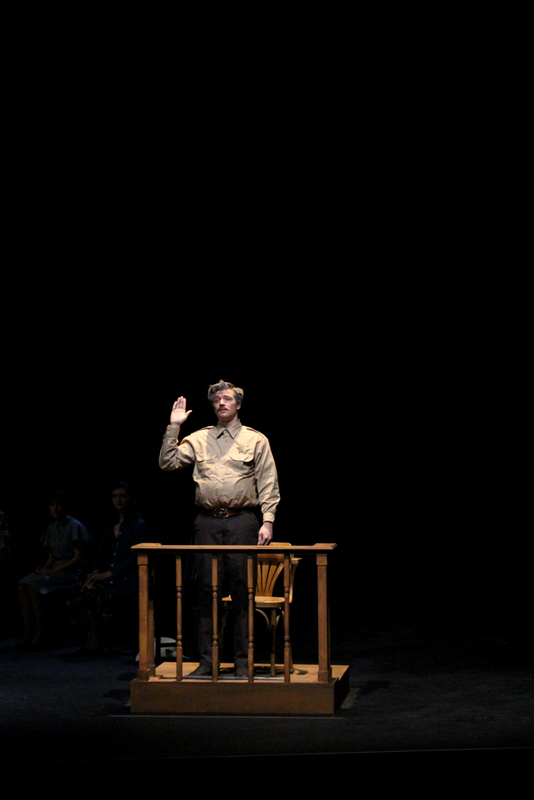 Huerta’s letter in the program also alludes to the play’s connection to the modern day, although he said that he also wanted to avoid making any direct connections to recent events surrounding police brutality and immigration politics. “What is clear is that little has changed since the 1970s at either the local, state or federal levels,” Huerta wrote in the program. Crossman discussed his challenge to empathize with his character when playing the part. He said, unlike a villain in a Shakespeare play who only exists inside of the story, Fred Hall was comparatively real. Nour Elsayed (senior) took the role of the title character. Similarly, he commented on the character of Debbie, Fred Hall’s daughter, played by Olivia Baldwin (first year), and what she reflects in the real world. He referred to a scene where Debbie speaks to Danny — in contrast to her father, Debbie is friendly, but she still displays racial prejudice. He also referenced scenes with Debbie’s mother, played by Milan Khali (senior), who unthinkingly dishes out several racist comments. “She must be hearing these things all throughout her life, so naturally she’s building a superiority complex to [people of color]. So I think racism is all across the spectrum. It can be super subtle, or it can be just blatant, like Fred Hall,” Elsayed said. Huerta said he wanted to use only a few props to keep the play minimalistic and leave components of the story open to the audience’s imagination.